If you read the newspapers, you might get the idea that ‘sharing’ consumption goods – houses, cars, tools… – is a new phenomenon. They call it the ‘sharing economy’, or ‘collaborative consumption’, and it is apparently all the rage. The collaborative consumption that takes the limelight, however, is that part which is mediated by commercial services brokering taxi fares, for instance, or holiday homes: companies for whom sharing is just the next business model, with the profits coming from skimming the turn-over of the providers of the goods. Yet of course, a lot of informal sharing goes on as well, both paid and unpaid. It is hard to measure, but it seems fair to assume that, with the Crisis, this has taken on large proportions since 2008. Only think of all the families who have lost their houses and had to move back in with their (grand)parents. For the people actually involved in sharing their resources, this is not another business model. For many, it is an economic necessity. Living in someone else’s house, driving their car, wearing second-hand clothes, washing them in the launderette: they are all different ways of saving money by sharing. Yet sharing does not just happen. People have to do it: it is a capacity, a skill. 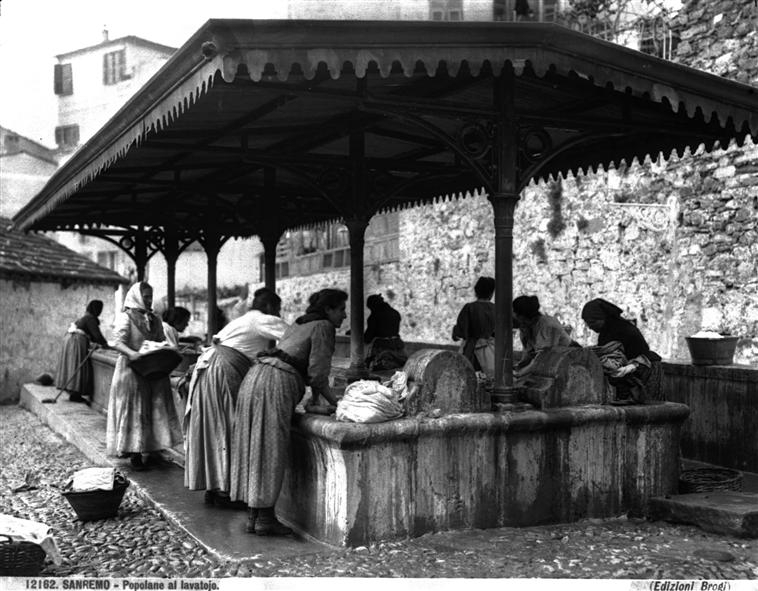 A shared laundry basin near the Mediterranean, c. 1900. Studio Carlo Brogi. We all know that in order to do some successful sharing, we need the right mindset. We have to trust the people we are sharing with and not be too attached to the things we are sharing. Pleasant sharing is the result of a certain mentality: a mentality that makes it normal, even enjoyable to share things. If you do not own this mentality, to share is hardship. If you do own it, you may in fact prefer to share a lot of things in your life, not (just) from a financial need, but out of conviction, idealism, or simply because that is how you were brought up. With the world’s cities growing ever more crowded, we have good reasons for increasing the amount of skillful and glad sharing that we do. – or because some cultures are simply better at it than other cultures. It is true that the degree to which people are happy to share their homes, their food, their clothes or their cars, varies dramatically between cultures. Those living around the European North Sea, for example, have historically been relatively bad at sharing – or relatively good at doing things on their own, if you want to put it that way (a lot of people do: they see history as a Robinson Crusoe epos). These Europeans organised their lives in nuclear families, each inhabiting a separate home rather than the extended-family farm or homestead common in many other parts of the world. This was related to the fact that many did not work for a family business, but earned an independent wage as employee elsewhere for much of their life. The good news that historians can bring, however, is that people have a huge capacity to change their attitudes. But in your own lifetime, too, you have probably experienced fluctuations in how used you are to sharing. You may have worked happily in a noisy classroom as a kid, but perhaps prefer to work in a quiet office of your own nowadays. You may also have grown more averse to sharing a bed, a dressing-room, or a coffee mug than when you were little. Yet because the historical evidence also shows developments that have moved in the opposite direction, towards more ‘collaborative consumption’, we may be optimistic about our potential for these changes, too. Now let’s think of ways to turn this potential into reality. How can we make sharing easier for the many of us for whom it is not? Struggling towards a better university? Yes please. Picket-lines over pay? Not so sure. Here I sit, at my desk, at work, Thursday, eleven o’clock. Everything’s normal, this is where I ought to be. Or not ought to be. For I am feeling weirdly conflicted about being here. I work at a university department. And outside my window, my colleagues are on strike. Employees of European universities have good reasons to be angry. The way the universities’ money is being divided between hand workers and brain workers, between women and men, en between brown people and pink people, is unequal and becoming even more unequal. People are paid for only a proportion of the hours they are asked to spend on their work. For teaching, for example, too few hours are being counted by the universities’ managers. Teaching, preparing classes, marking exams, communicating with students, being a mentor: all these things take much more time in reality than what teachers’ bosses seem to think. A third important problem is that researchers and teachers are being judged by numbers: the numbers of students they attract, the number of doctoral theses they ‘deliver’, the number of articles they publish. Too little value is placed on things that take time and subtlety: helping a student who has problems at home; giving your ideas on the future of education, or helping make your town a nice place to live (feeling that your place has a history and that you are part of it, are important for your well-being); doing more exciting stuff in your classes than ‘going through the literature’ or ‘giving an overview of the period’; coming up with really novel ideas, even if you are no native speaker of common-room English but happen to have been born in China or Cameroon, which makes your articles a little less ‘fun’ to read (English is rapidly becoming the only accepted language for ‘serious’ publications, even though that means many people who are no academics cannot read your research results); or taking the time to read what other researchers have been up to (to prevent that you will be doing the same work all over again!). So, problems enough. And these problems do not just exist in the UK, where today’s strike is taking place: universities in various European countries, and no doubt elsewhere, face exactly the same issues. The universities themselves are not always very responsive to these issues. To give just one example: instead of hiring more teachers, they organise ‘relax’ sessions for their existing pool of teachers. One vice chancellor even sent out an email to all his staff, insinuating that they don’t care about their students and that they will be social outcasts if they participate in the strike. This message was almost enough reason for me to join the strikers in front of our building. But do not universities and their employees share a common goal? Where is the conversation between management and workers? (This is exactly what a colleague also said to me.) Are the managers only there to ensure that their institution has a financial future (and I do understand that that is hard enough). Or a human future as well? In spite of these issues, The higher education unions of Britain have chosen to focus on the slogan ‘13% pay cut (in real terms) since 2008’. 2008. Precisely. The year the crisis began. It would not surprise me if real-term pay have been lowered equally drastically across all European sectors, and not just at universities. Now I need to add that I am new to this environment. I don’t know precisely how unions and strikes and contract negotiations work at universities, and particularly in the country where I work now. This makes my observations stronger, but weaker at the same time: I realise that. I was quite surprised, for example, to be found guilty of officially crossing a ‘picket-line’ when all I thought I was doing was say hi to my colleagues on strike, go to work and do some writing for myself. I had no idea there was something like an ‘official picket’. I am doing no teaching or other work for which my bosses could ‘miss’ me at the moment, so I thought there would be no point in me striking (except, perhaps, my presence in the crowd). All I would harm would be myself. You could even consider that the university is actually doing me a favour at the moment by providing me with an office, internet, supporting staff and tea water. But then again, as the picketers pointed out to me, the very fact that I consider it this way, and that the university does not seem to be valuing sufficiently the enormous contributions of all those PhD-students who teach for little or no salary, short-term contract workers who need to move to a whole different city or even country every three year, and 0-hour-contract, associate and honorary staff, is not right. There is something rotten here. Education and research need rethinking. But what I don’t understand, is why unions focus on salary levels, and then send pretty-well-paid members to the streets. Because where were the cleaners, the data-entrists, the PhD-students, the fixed-contract workers this morning? I spoke to a couple of them at work. They were either afraid of striking/missing out on their meagre income (but didn’t they invent funds and stakingskassen for those people?). Or they felt they owed it to themselves to do their work. Or replied that they were actually quite satisfied with what they are being paid at the moment. Perhaps even more importantly, where were the professors? (That is to say: I did not see any. But there may have been a few that I have not yet met.) If anyone is in a strong position to speak for those without a steady contract – if anyone has a paternalist obligation towards their juniors, it is them. But perhaps the strike focused too much on salary-levels for them to feel they had reason to protest? Another thing I don’t fully understand, is why some picketers (only some of them!) try to prevent colleagues and students from entering university buildings, sometimes in quite nasty ways. I read on the English wikipedia that this is a well-worn strategy: ‘harming the business through loss of customers and negative publicity’. But I seriously doubt whether making people dislike you creates any understanding of the issues workers at universities have to deal with – and of the questions about education and research that we all have to deal with, as members of a society. But all of this calls for a large-scale demonstration by students, parents, teachers – in short: citizens – rather than an employees’ strike. And here I am, sitting at my desk, at work, scared of running into colleagues on strike (with whom I sympathise very much! Only I don’t see the use of my not meeting a deadline today, and I don’t identify with the pay demand the union has printed on their banners). I’ve only just begun my work here, and I’ve already come out as a scab. P.S. Look out for my related column on the ‘mad professor’, or the ‘secluded scholar’ (whichever name you prefer), and the problem of ‘public engagement’. Note: this column was posted a few hours after it was written.